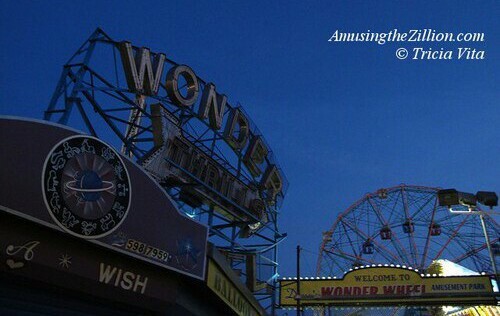 This weekend, Deno’s Kiddie Park and Ruby’s Bar on the Coney Island Boardwalk will open for the 2014 season, to be followed by next week’s official Palm Sunday Opener for the Wonder Wheel, Cyclone and the rest of the amusements. The park and concession owners are busy getting ready, but by the time we went for a stroll on Wednesday evening around 8 pm, almost everyone had gone home for the night. Surf Avenue and the Boardwalk were lit up but eerily deserted. Wednesday was our first glimpse of the Wonder Wheel’s cars back up on the wheel. The freshly painted cars were rolled out of winter storage and put up on Tuesday. 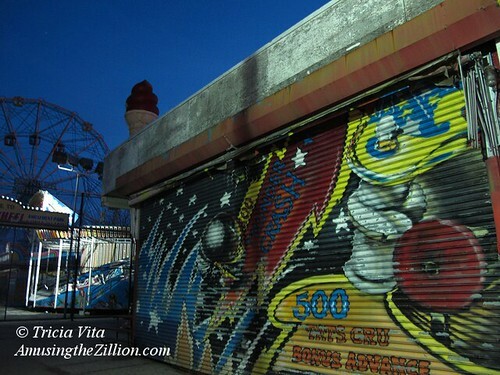 We missed it this year, but the annual ritual is the first sign of spring in Coney Island. Being there to see the red, blue and white cars go up, the Swinging ones first and then the Stationary, is like seeing crocuses bloom before your eyes. This mural at the corner of Jones Walk and the Bowery is one of the few remaining works of Steve Powers and Creative Time’s Dreamland Artist Club. It’s still holding its own. John “Crash” Matos painted the rolldown gate of the Snack Bar in 2005, but the work of Ronnie Cutrone, which was just above it, was stripped and taken away a couple of years ago, as were the rest of the signs on Jones Walk. 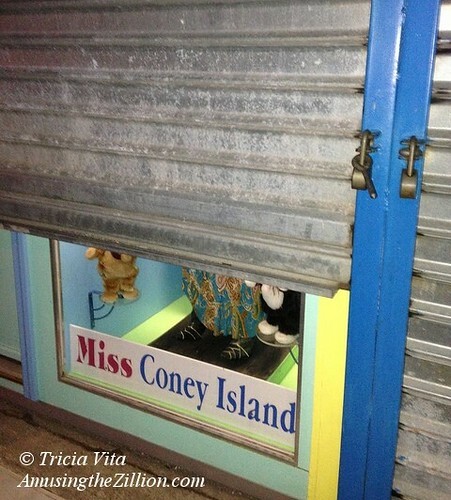 On West 12th Street, the feet of the dancing doll “Miss Coney Island” and her dancing cats were peeking out from beneath the partially open metal shutter. 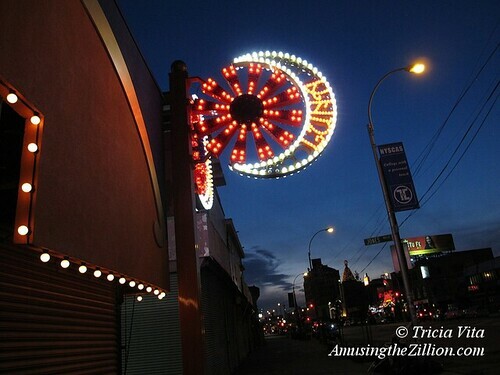 Miss Coney as well as the window featuring the miniature rides of “Coney Island Always” will be open this weekend. They’re located on West 12th Street next to the Coney Island History Project and a few steps from the entrance to Wonder Wheel Park. Still 25¢ to Fall in LOVE! Next door, Feed the Clown and the other independently owned games were brightly lit and the only place open on the block, though not yet open for business. The joints were being flashed for Opening Day. 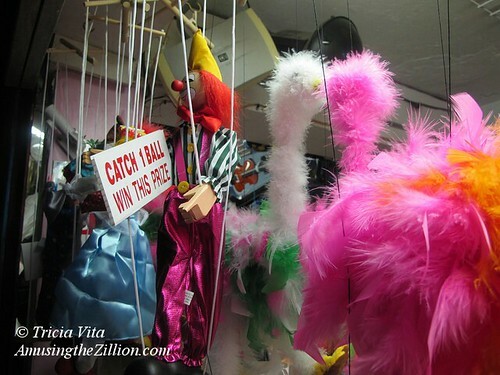 A group of marionette prizes danced in frenzied unison. Their strings were being manipulated by an unseen force. Merry-go-round music played. We made a movie (Stay tuned.) 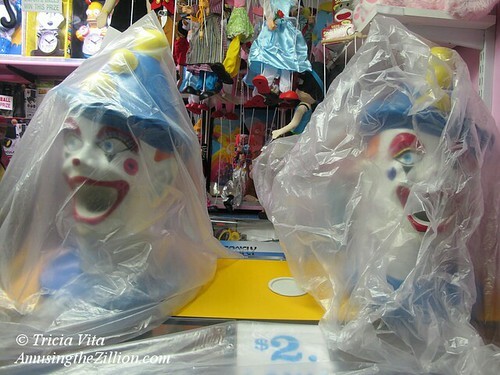 Did you ever notice that clowns look even creepier covered in plastic tarps? 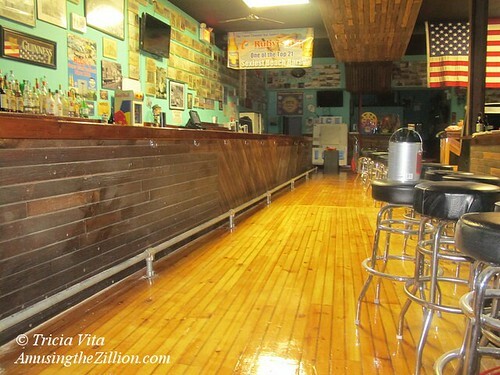 At Ruby’s Bar on the Boardwalk, the newly refinished floor was glowing. A solitary worker, who was about to leave for the night, opened the door so we could get a photo. Coney Island’s oldest bar and its famous jukebox opens on Saturday for the season. Cheers! 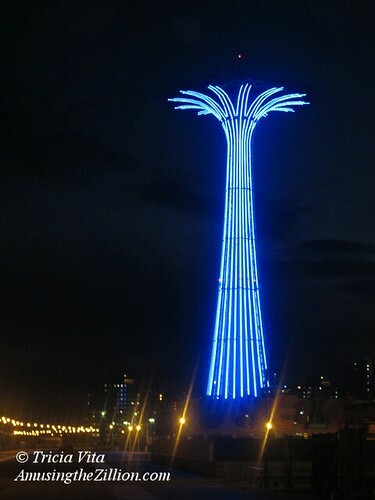 On Wednesday, the Parachute Jump was lit blue for Autism Awareness Day. There was a ceremony at 6:30 in the evening, but by the time we got there no one was on the Boardwalk. Slivers of light glimmered beneath the metal shutter of Place to Beach Bar. Workers opened the side door, ready to call it a night. A crescent moon was suspended in the sky over the Jump. 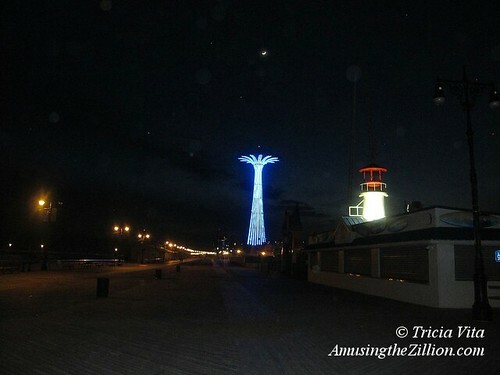 Currently, the Parachute Jump is lit nightly from 4:30pm until midnight or later. The landmarked tower’s 8,000 LEDS are illuminated year-round like the Empire State Building and the Eiffel Tower. The light show changes according to the day and the season. It was specially programmed with a “Happy Holidays” message and Christmas-y colors by Luna Park. In celebration of the Seattle Seahawks Super Bowl win, the Jump was lit in sea green and blue light, and it was green on St Patrick’s Day.